The weather continued its gloominess as we packed up in Coral Bay and headed to Exmouth. The weather forecast for the coming week had been updated overnight for the worse. Driving towards Exmouth and into the pouring rain, we decided to check into a caravan park and plug into power to recharge the battery after pretty limited solar charging the last few days. We set up the tent in the rain and decided to drag the tarp across for extra protection. Good thing we did as in rained solidly over night. The next morning it was still raining and we decided to stay in the caravan park another day to wait it out. A pretty quite day we donned raincoats for a short walk into town to check it out. A quick stop at the IGA supermarket and we were back in the tent to watch some movies on the laptop. The next day the weather forecast was now saying that the cloud and rain cover were settling in for the week. We couldn’t wait that long for the weather to break so agreed to change our plans and head inland towards Tom Price. 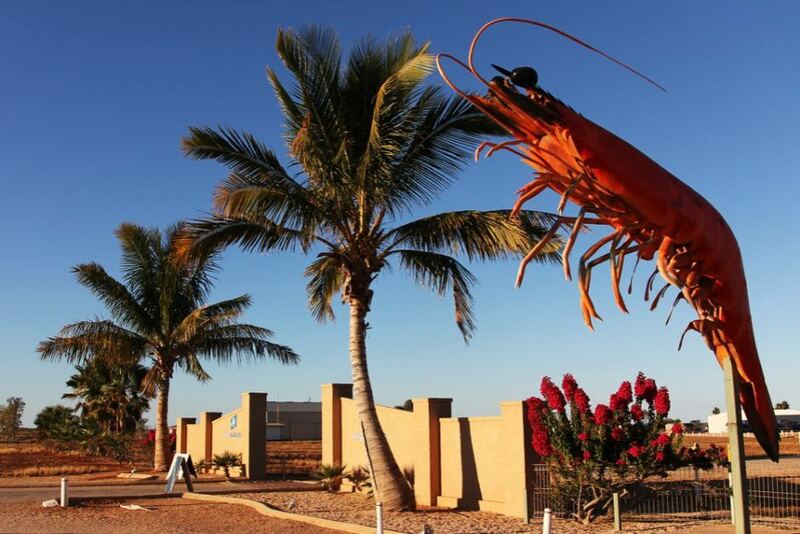 It was only when we were a couple of hours outside of Exmouth that we realised that we never got a photo of the Big Prawn that we’d seen the day before for our ‘Big Thing’ collection. So here’s a shot of the Big Prawn taken on a much sunnier day for your enjoyment.